On 27 April 1994, South Africa held its first post-apartheid elections with universal suffrage, where all people independent of gender and race could vote. The elections ushered the once-banned African National Congress (ANC) party into government. April 27 is Freedom Day, an annual national holiday in South Africa. The ANC election victory brought another historic development. On 10 May 1994, Nelson Mandela was officially inaugurated as the first black person to be democratically elected President of South Africa. 2014 marks the 20th anniversary of the first freely run post-apartheid elections and of Nelson Mandela as elected President. National elections were held on 7 May 2014; these elections were the fifth held in the post-apartheid era, and the first held since Mandela’s passing in early-December 2013. With 18 years the minimum age for people to vote in South Africa, the 2014 elections included the first voting “born-free generation” who have never known a nation under apartheid. Nelson Mandela and F. W. de Klerk both won the 1993 Nobel Peace Prize. 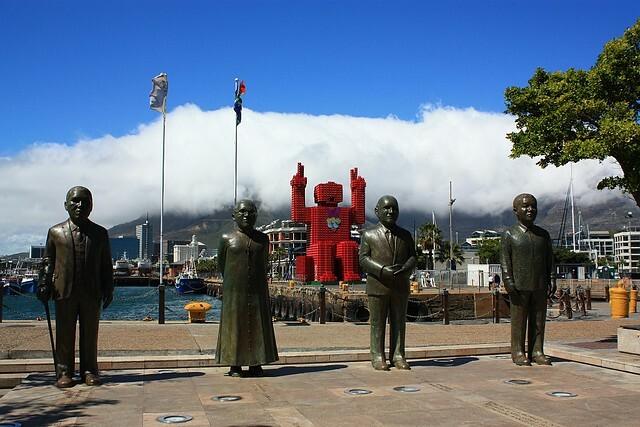 I made the two photos above at Cape Town’s Nobel Square in October 2012. This post appears on Fotoeins Fotopress at fotoeins.com as http://wp.me/p1BIdT-45A. “That is left as an thoughtful exercise to the viewer and visitor.” 🙂 Thanks, Alex, for stopping by and for your kind comment! Hi, Vanessa. Amazing, isn’t it? It’s a cliché, but it’s very true: time does fly. When a wae lad was I, I never thought I’d see the Iron Curtain come down, the dissolution of the Soviet Union, and the end of Apartheid. But there’s a worry (among many) in South Africa that many of this new “born-free” generation aren’t interested in voting, they’re disillusioned with how the present state of the country. Thank you for stopping by and for your kind comment!